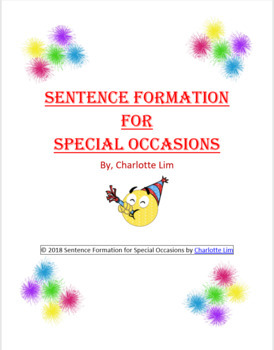 This package is designed to help your students build your students’ develop their writing skills with a focus on sentence structure, printing on the lines and incorporating capitals and periods effectively. It offers your students an opportunity to enjoy solving language arts word puzzles while celebrating different special occasions together. I have included an assessment guide and an answer key for each activity. All of the items listed align with the Core Competencies and the New B.C. Curriculum. If you enjoy this product, please rate it. Thank you.